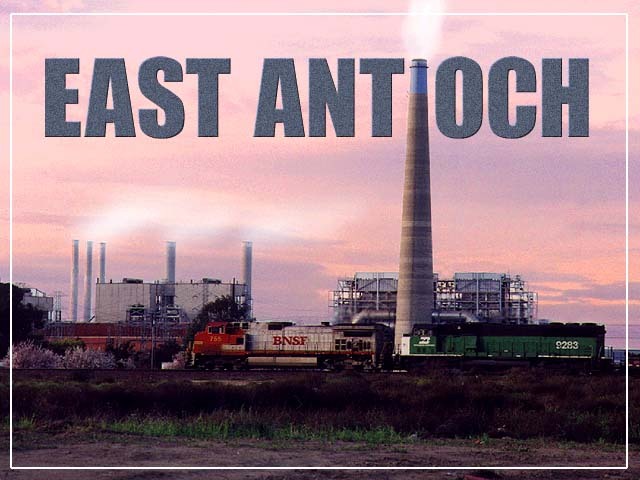 East Antioch is little more than one segment of a very long yard that stretches from Du Pont on the east side to Pittsburg on the west. The track is frequently used to store empty boxcars for use at the Gaylord paper mill, as well as coil cars and "bare tables"  empty piggyback or double stack cars. You can view this stretch of track from either its north or south side. Neither is particularly accessible without trespassing on grape vineyards. From the south looking north you can watch long trains virtually unobstructed by development, although businesses have encroached on the area in recent years. If you take Holub Avenue to its end near the K-Mart shopping center and the storage sheds there is a dirt lot where you can set up for some nice photos. It rises just a bit above the street and the grapes to the west. 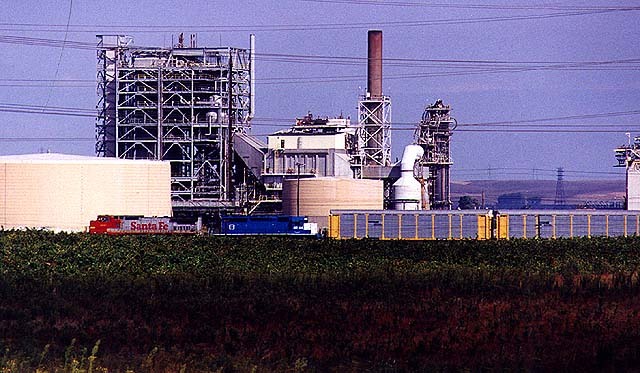 A large power plant is recognizable from its enormous smokestack. You will also see the eastern end of Gaylord and a concrete batch plant. From the north side looking south your view is partially blocked by the remnants of an old orchard and a grape vineyard that rises slightly above the road. More annoying are the large utility towers that feed from the nearby power plant. The grapes change color with the seasons and make for some beautiful photos, particularly during mid-autumn. Awestbound freight train is viewed from Wilbur Avenue looking south on an overcast morning in December 1998. Photo by Roni Gehlke. It is summertime and the grapes are in robust health. A trio of warbonnets play hide-and-seek behind a row of small trees that sit near the right of way. Photo by Roni Gehlke. Now here's an unusual sight  an Amtrak San Joaquin with locomotives on both ends. Due to a track maintenance blitz near Bakersfield in January 1999, Amtrak was forced to terminate its trains in Fresno where there are no facilities to turn locomotives. To alleviate this problem, Amtrak ran most of its trains during this two-week period with locomotives at both ends. This photo is taken from the south side of the tracks. Photo by Glenn Gehlke. 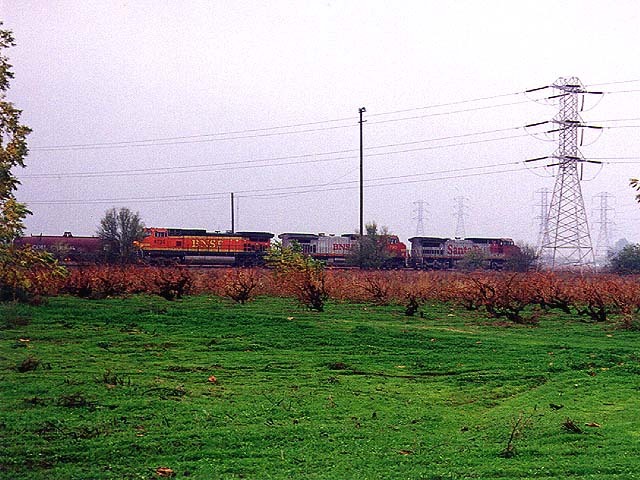 A BNSF vehicle train heads west past the eastern end of the Gaylord California Mill in October 1998. Fields of grapes contrast with the industrial landscape here. 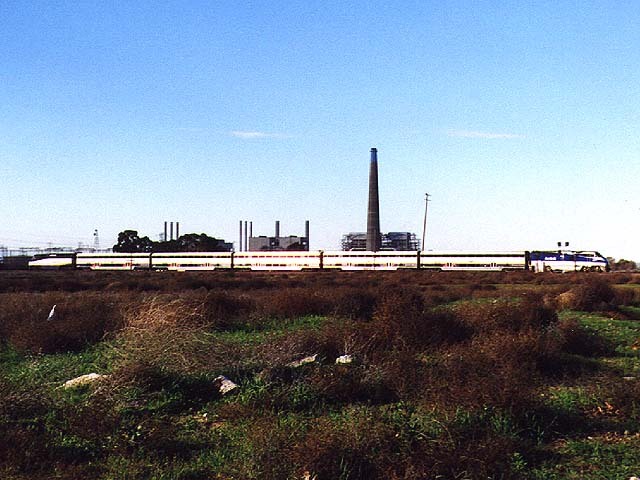 The large storage tank visible in the lefthand portion of the photo no longer stands. Most of the other structures are in the process of being demolished. Photo by Roni Gehlke. The former PG&E power plant is the centerpiece of this homemade postcard (with steam clouds added for effect). A westbound freight train is dwarfed in the foreground. Photo by Roni Gehlke. This page was last updated Tuesday, August 3, 1999 at 23:55 hrs.